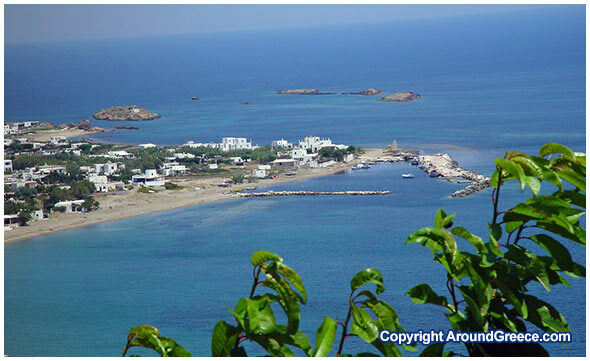 The charming coastal resort of Molos appears as though it is part of the neighbouring town of Magazia. Over the years, the town towns have grown closer together, and almost feel as though they are one. With the capital of Chora overlooking in the distance, the scenery here is one of beauty and inspiration. The popular beach of Molos, with it’s soft sands and crystal blue waters, make it an ideal place to visit during the summer months. Here you can bath in the sea, and enjoy the sunshine and relaxing atmosphere. The small harbour of Molos is a very picturesque one, with the white houses and colourful boats, floating in the sea. There is a stone built waterbreaker at the harbour, and it is a nice place to take a stroll in the early evening, where you can admire the beautiful sunsets. Next to the sea is an old windmill, that now operates as a taverna. This windmill is a perfect photo opportunity, and provides a brief step back in time, when the region here was less developed. There is a range of accommodation available for visitors in Molos, including many rooms and to let and apartments. You will also find a nice selection of various tavernas and cafe bars where you can enjoy a meal or drink.